Denby has been making high-quality handmade pottery for more than 200 years. The company has over 500 employees, 250 in its main factory in Denby, Derbyshire, plus those in 30+ retail outlets around the UK and in its warehouse and one other pottery. Denby’s workers are kitted out with uvex safety footwear, respiratory and hearing protection and gloves. Gary Pearson, Denby’s UK Group Health and Safety Manager, has been with the company for nine years and has been a customer of uvex for 15 to 20 years. He is responsible for health and safety implementation and management throughout the company. One of the issues that prompted Gary to investigate uvex PPE was comfort, a huge factor at Denby. Some of its employees stand on their feet for 10 to 12 hours a day, so their footwear must fit well while providing adequate protection from fatigue and workplace hazards. “We have had numerous comfort issues – comfort is extremely important to ensure compliance,” Gary emphasises. 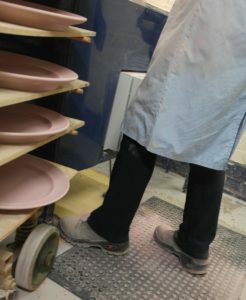 Another challenging area for Denby was the quality and sustainability of products, as they need to perform well to withstand the tough pottery environment, a mixture of wet and dry, where natural products that can eat away at leather shoes are used. Along with other potteries, Gary took part in helping the Health & Safety Executive (HSE) review issues specific to the pottery industry as part of its updating of COSHH Essentials advice sheets. Having done so, Gary decided to review and update Denby’s range and search for improved quality and more comfortable products. He chose uvex PPE over that of other manufacturers because of its high quality. Gary subsequently invited uvex to review Denby’s hearing protection, gloves and footwear, and the company has now switched to all of these forms of PPE after consultation and trials. Both Gary and his workers are extremely pleased with uvex’s innovative xact-fit earplugs, which are so comfortable and easy to fit accurately and which adapt perfectly to the natural shape of the ear canal, markedly reducing pressure. Denby has a number of processes that require specialist hand protection. 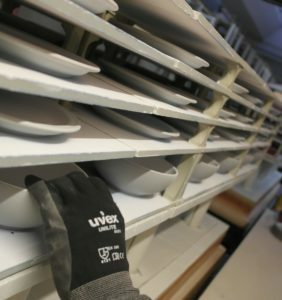 For example, in one glazing process employees have to manually run their hand along plates to check the glaze, which could easily result in cuts. Employees are also required to use touch screens and take stickers off machines, a job for which the uvex unidur 6613 three-open-finger glove is ideal, as it gives outstanding touch and dexterity, as well as good grip, breathability and high resistance to abrasion and tear. Denby now also takes the uvex phynomic wet and wet plus safety gloves for their excellent grip in wet or oily conditions, comfort and innovation. Comfort and innovation were again reasons why Denby chose uvex’s innovative Heckel brand of safety boots and shoes, with its hard-wearing design which withstands the rigours of demanding industrial environments. After extensive trials, Denby has approved the Heckel MAC Crossroad, the Heckel MACsole FXL and FXH boot and shoe and the Heckel Suxxeed range because of their supreme comfort. It’s not only about the quality and comfort of the products for Gary. The level of expertise and specialist support they receive from uvex are also vital factors. “The support really is excellent. There is always someone at the end of the phone, someone who is prepared to come in and go the extra mile for you. It is exceptional,” he enthuses. Denby will definitely continue to use uvex products. “If we needed more or different PPE, or a new process came in, uvex would be the first company we would look to,” states Gary. This is great sharing. Thanks for this useful information.